What is Radiofax (aka Weatherfax or HF Fax)? Fax Authority >> Glossary >> What is Radiofax (aka Weatherfax or HF Fax)? Radiofax (also known as Weatherfax or HF Fax) is a method of transmitting monochrome images that preceded slow-scan television and the commercial fax machine. Radiofax was used in the 1950s to send weather charts over landlines as well as HF radio. Radiofax works in many ways the same as fax technology, scanning line by line and encoding that information into an electrical signal that is then transmitted by phone line or radio wave. Radiofax and Weatherfax data can still be obtained today through the National Oceanic and Atmospheric Administration through an FTP download. Radiofax is still used to disseminate weather and climate data to shipping where the internet and phone access is limited. Normal radio fax transmission speed is 120 lines per minute. However, 240 LPM can be achieved in monochrome or color fax. Primary radiofax use today is primarily along coastal regions for sending weather charts and data. In the United States, preparation usually comes from the National Weather Service of the National Oceanic and Atmospheric Administration. 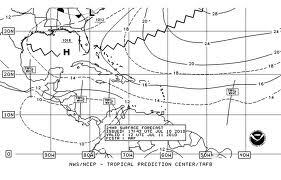 Information can also come from the Tropical Analysis and Forecast Branch of the Tropical Prediction Center & National Hurricane Center broadcast over US Coast Guard stations. Radiofax transmission also comes from the Ocean Prediction Center of the NWS. In Canada, Canadian Forces Meteorology and Oceanography Center (METOC) transmits in radiofax as well as in radio-teletype. Although in the past it was more popular, the only remaining news agency transmitting in radiofax is Kyodo News of Japan. Primarily for communicating to fishing fleets in the Pacific Ocean.